Bijou was awarded in 2016 with a hospitality award for ‘Best Cocktail bar’ by Venuez. I love this place for their warm welcome and perfect service. 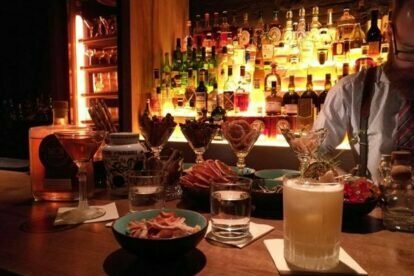 Dieter Van Roy will serve you the best cocktail, and don’t by shy to ask him more information about your mix: he is more than welcome to animate you with his knowledge. During winter time, they serve hot drinks, e.g. buttered rum & Irish coffee. Check their Facebook page to see pictures of their crazy mixed and served cocktails. Or perhaps you’re more into a blend or some other liqueur? Just ask, and they will advise you to experience your new favorite drink. Or do you want to try something unique made by Bijou? Ask for their own special mixes – my last one was with Rochefort 10 liqueur (Belgian top beer). They are called small badge-aged cocktails. A little bit hungry? Order their delicious tapas plate for €12.50. For smokers: there is a cosy smoking area inside at the end of the bar. Personal tip: Bijou is close to another hot spot in Antwerp, ‘t Zuid, with many restaurants. So you can have you aperitif or your after-dinner at Bijou. Another personal tip: It’s an ideal place for a romantic tête-à-tête.